DIE Jovis, videlicet, 4 die Novembris. The King's Letter about Ireland (Vide the Letter). Sir William Berkeley and Sir Francis Wyatt. Marquis Winton Leave to sell his Arms. Votes of the Commons, concerning Ireland. Declaration to be sent to the Lords Justices of Ireland, from both Houses. Letter from both Houses, to be sent with the Declaration. Letter and Declaration agreed to. All the Resolutions and Votes of the Commons in this Business agreed to. All to be sent to Ireland. Ports towards Ireland to be stopped. Message to the H. C. that the Lords concur with them about Ireland. Declaration about Ireland sent to His Majesty. Lord Mayor to prevent Tumults. Fowler, for false Weights, to be prosecuted in the King's Bench. The Lord Keeper signified, "That he had received a Letter from Mr. Secretary Vane, dated the 28th of October last, from Holyroode House, touching the Intelligence which His Majesty hath received in Scotland, concerning the Rebellion in Irelande; which is, by His Majesty's Command, to be communicated to both Houses of Parliament here, to whom He hath recommended the Care of those Affairs, and expects their Advice what Course is fittest to be taken for the reducing of that Kingdom." Likewise his Lordship said, "He had received Copies of other Letters, which were sent to His Majesty out of the North Parts of Ireland, desiring His Majesty to send them speedy Supplies, for the saving of that Kingdom." Hereupon it is Ordered, That those Copies of Letters are referred to be considered of by the Committees for the Irish Affairs. Ordered, That the Earl of Holland, Lord Mowbray, and the Lord Pagett, shall be added to the Committee for the Irish Affairs; which Committee went presently to give a Meeting (fn. 1) to the Committee of the House of Commons, in the Painted Chamber. Ordered, That the Cause between Sir William Berkeley and Sir Francis Wyatt shall be heard by their Counsel To-morrow, when this House sits; and that Mr. George Sandys (appearing on the Behalf of the said Sir Francis Wyatt) shall be heard what he can say in his Behalf; and that the several Patents granted to the Parties shall be produced, or true Copies of them; and that the Witnesses on both Sides shall then attend the said Hearing. Ordered, That the Lord Marquis of Winton shall have free Liberty, by virtue of this Order, to sell off his Arms to such Tradesmen as will buy the same. Ordered, That the Lord Viscount Loftus's Cause, brought up from the House of Commons, and depending now in this House, shall be heard at this Bar on Thursday the 18th of this Instant November at such Time as this House shall then sit; at which Time and Place all Parties and Witnesses interested in the said Cause are to give their Attendance accordingly. "That the House of Commons holds it fit, that Twenty Thousand Pounds shall be forthwith supplied, for the present Occasions of Ireland, out of the Monies that are now in ready Cash, or shall first come in. "That a convenient Number of Ships shall be provided, for the guarding of the Sea Coasts of Ireland. "That the House of Commons holds it fit, that Six Thousand Foot and Two Thousand Horse shall be raised, with all convenient Speed, for the present Expedition in Ireland. "That such Officers shall be forthwith sent over into Ireland, for the commanding of Men there, as shall be thought fit by the Lord Lieutenant of Ireland, with the Approbation of both Houses of Parliament. "That a Magazine of Victuals shall be forthwith provided at West Chester, to be sent over to Dublin, as the Occasion of that Kingdom shall require. "That the Magazine of Arms, Ammunition, and Powder, now at Carlile, shall be forthwith sent over to Knockfergus, in Ireland. "That, in Bristoll and West Chester, and One other Port in Cumberland, Magazines of Arms, Ammunition, Powder, and Victuals, shall be provided, to be transported into the next convenient Ports of Ireland, as the Occasions of that Kingdom shall require. "That all Arms, Ammunition, and Powder, in the Magazine at Hull (except such a Proportion of Powder, Bullet, and Match, as shall be thought fit for Supply of the Northern Counties, as Occasion shall require), be transported to The Tower of London. "That a convenient Number of Engineers and Gunners be sent into Ireland. "That a Post shall be set up, between Beaumarish and Holyhead. "That it be referred to the King's Counsel, to consider of some fit Way, and to present it to the Houses, for a Publication to be made, of Rewards to be given to such as shall do Service in this Expedition into Ireland, and for a Pardon of such of the Rebels in Ireland as shall come in by a Time limited, and of a Sum of Money to be appointed for a Reward to such as shall bring in the Heads of such principal Rebels as shall be nominated. "That Letters shall be forthwith sent to the Justices in Ireland, to acquaint them how sensible this House is of the Affairs in Ireland, and what Care they have taken for the Occasions of Ireland. "That the House of Commons holds it fit that a Drum shall be forthwith beaten, for the calling in of Volunteers to this Service for Ireland. "That Directions be given for the drawing a Bill for the pressing of Men for this particular Service for Ireland; and Mr. Serjeant Wylde is desired to prepare a Bill to that Purpose. "Ordered, That the Eleven Thousand Pounds in ready Cash, in the Chamber of London, shall be forthwith paid over to the Lord Lieutenant of Ireland, for the present Occasions of that Kingdom; and that the Commissioners and Treasurers appointed in the Act grant forth their Warrants and Orders accordingly. "Ordered, That the Officers and Customers of the several Ports of this Kingdom towards Ireland do make diligent Search, in all Trunks and other Carriages that come to be transported from England to Ireland, that belong to any Papist or suspected Person. "And further the House of Commons have Ordered, That those Trunks sent by Exeter shall be stayed and searched. "Ordered, That the Committee for Irish Affairs of the House of Commons shall propound to the Committee of Lords, to prepare Heads to be considered of, how and in what Manner this Kingdom shall make Use of the Friendship and Assistance of Scotland, in this Business of Ireland." 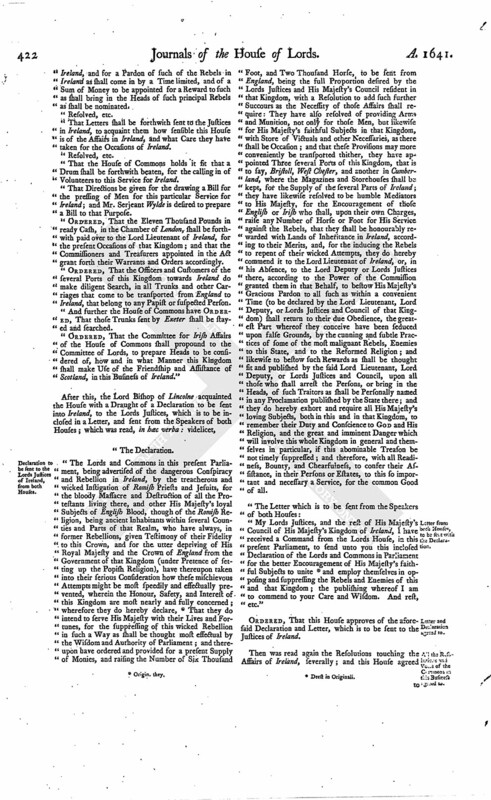 "The Lords and Commons in this present Parliament, being advertised of the dangerous Conspiracy and Rebellion in Ireland, by the treacherous and wicked Instigation of Romish Priests and Jesuits, for the bloody Massacre and Destruction of all the Protestants living there, and other His Majesty's loyal Subjects of English Blood, though of the Romish Religion, being ancient Inhabitants within several Counties and Parts of that Realm, who have always, in former Rebellions, given Testimony of their Fidelity to this Crown, and for the utter depriving of His Royal Majesty and the Crown of England from the Government of that Kingdom (under Pretence of setting up the Popish Religion), have thereupon taken into their serious Consideration how these mischievous Attempts might be most speedily and effectually prevented, wherein the Honour, Safety, and Interest of this Kingdom are most nearly and fully concerned; wherefore they do hereby declare, (fn. 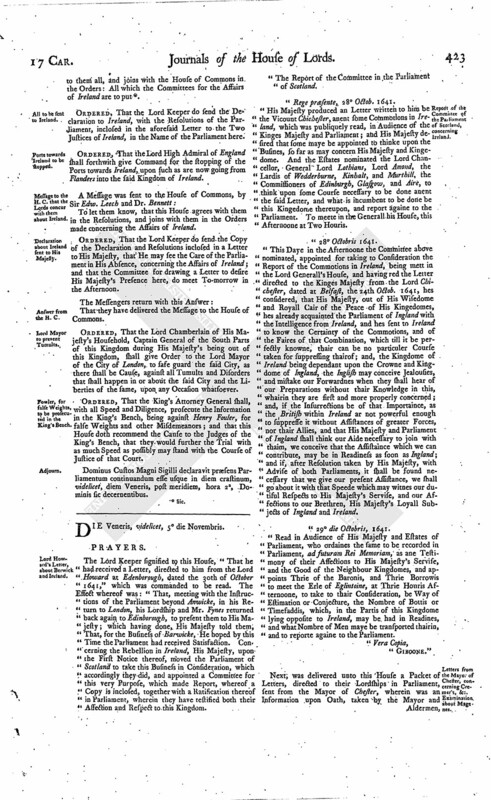 3) That they do intend to serve His Majesty with their Lives and Fortunes, for the suppressing of this wicked Rebellion in such a Way as shall be thought most effectual by the Wisdom and Authority of Parliament; and thereupon have ordered and provided for a present Supply of Monies, and raising the Number of Six Thousand Foot, and Two Thousand Horse, to be sent from England, being the full Proportion desired by the Lords Justices and His Majesty's Council resident in that Kingdom, with a Resolution to add such further Succours as the Necessity of those Affairs shall require: They have also resolved of providing Arms and Munition, not only for those Men, but likewise for His Majesty's faithful Subjects in that Kingdom, with Store of Victuals and other Necessaries, as there shall be Occasion; and that these Provisions may more conveniently be transported thither, they have appointed Three several Ports of this Kingdom, that is to say, Bristoll, West Chester, and another in Cumberland, where the Magazines and Storehouses shall be kept, for the Supply of the several Parts of Ireland; they have likewise resolved to be humble Mediators to His Majesty, for the Encouragement of those English or Irish who shall, upon their own Charges, raise any Number of Horse or Foot for His Service against the Rebels, that they shall be honourably rewarded with Lands of Inheritance in Ireland, according to their Merits, and, for the inducing the Rebels to repent of their wicked Attempts, they do hereby commend it to the Lord Lieutenant of Ireland, or, in his Absence, to the Lord Deputy or Lords Justices there, according to the Power of the Commission granted them in that Behalf, to bestow His Majesty's Gracious Pardon to all such as within a convenient Time (to be declared by the Lord Lieutenant, Lord Deputy, or Lords Justices and Council of that Kingdom) shall return to their due Obedience, the greatest Part whereof they conceive have been seduced upon false Grounds, by the cunning and subtle Practices of some of the most malignant Rebels, Enemies to this State, and to the Reformed Religion; and likewise to bestow such Rewards as shall be thought fit and published by the said Lord Lieutenant, Lord Deputy, or Lords Justices and Council, upon all those who shall arrest the Persons, or bring in the Heads, of such Traitors as shall be Personally named in any Proclamation published by the State there; and they do hereby exhort and require all His Majesty's loving Subjects, both in this and in that Kingdom, to remember their Duty and Conscience to God and His Religion, and the great and imminent Danger which will involve this whole Kingdom in general and themselves in particular, if this abominable Treason be not timely suppressed; and therefore, with all Readiness, Bounty, and Chearfulness, to confer their Assistance, in their Persons or Estates, to this so important and necessary a Service, for the common Good of all. 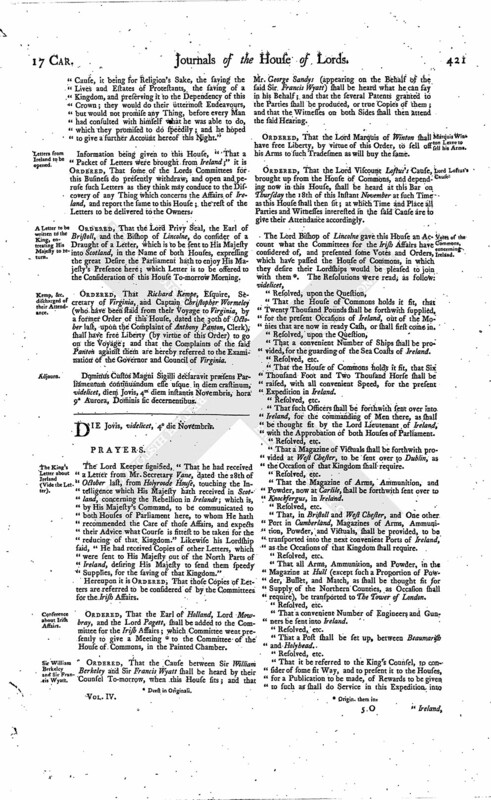 "My Lords Justices, and the rest of His Majesty's Council of His Majesty's Kingdom of Ireland, I have received a Command from the Lords House, in this present Parliament, to send unto you this inclosed Declaration of the Lords and Commons in Parliament for the better Encouragement of His Majesty's faithful Subjects to unite (fn. 4) and employ themselves in opposing and suppressing the Rebels and Enemies of this and that Kingdom; the publishing whereof I am to commend to your Care and Wisdom. And rest, etc." Ordered, That this House approves of the aforesaid Declaration and Letter, which is to be sent to the Justices of Ireland. Then was read again the Resolutions touching the Affairs of Ireland, severally; and this House agreed to them all, and joins with the House of Commons in the Orders: All which the Committees for the Affairs of Ireland are to put (fn. 5). Ordered, That the Lord Keeper do send the Declaration to Ireland, with the Resolutions of the Parliament, inclosed in the aforesaid Letter to the Two Justices of Ireland, in the Name of the Parliament here. Ordered, That the Lord High Admiral of England shall forthwith give Command for the stopping of the Ports towards Ireland, upon such as are now going from Flanders into the said Kingdom of Ireland. To let them know, that this House agrees with them in the Resolutions, and joins with them in the Orders made concerning the Affairs of Ireland. Ordered, That the Lord Keeper do send the Copy of the Declaration and Resolutions inclosed in a Letter to His Majesty, that He may see the Care of the Parliament in His Absence, concerning the Affairs of Ireland; and that the Committee for drawing a Letter to desire His Majesty's Presence here, do meet To-morrow in the Afternoon. That they have delivered the Message to the House of Commons. Ordered, That the Lord Chamberlain of His Majesty's Household, Captain General of the South Parts of this Kingdom during His Majesty's being out of this Kingdom, shall give Order to the Lord Mayor of the City of London, to safe guard the said City, as there shall be Cause, against all Tumults and Disorders that shall happen in or about the said City and the Liberties of the same, upon any Occasion whatsoever. Ordered, That the King's Attorney General shall, with all Speed and Diligence, prosecute the Information in the King's Bench, being against Henry Fouler, for false Weights and other Misdemeanors; and that this House doth recommend the Cause to the Judges of the King's Bench, that they would further the Trial with as much Speed as possibly may stand with the Course of Justice of that Court. Dominus Custos Magni Sigilli declaravit præsens Parliamentum continuandum esse usque in diem crastinum, videlicet, diem Veneris, post meridiem, hora 2a, Dominis sic decernentibus.